According to the July 2011 data from CMS there are over 75,000 clinicians currently registered for the various Medicare and Medicaid Meaningful Use incentive programs. A tiny fraction of these, 2246 to be exact, has successfully attested to meeting all Meaningful Use criteria (or claimed allowed exclusions), and about half have gotten the much coveted incentive checks. Considering that these figures include Nurse Practitioners, Dentists and Optometrists, it seems that the physicians that expressed interest in the incentives by registering with CMS are the same 6.9% that were identified by CDC in 2010 as using fully functional EHRs back in 2009. Even if we assume that the second half of 2011 will bring a surge in attestations to meaningful use of certified EHRs, it is still unlikely that a majority of those registered will go through attestation. There are three broad reasons for these low numbers. First, there are those working their way through the 90 days attestation period as we speak, or are planning to start any day now. These folks have their ducks in a row and will attest in 2011. Second, there is a group that went ahead and registered with CMS “just in case”, but made no commitment to investing the energy and time needed to fulfill Meaningful Use requirements. These physicians are still debating whether they should upgrade their EHRs to a certified version, or if they already have a certified EHR, whether they are ready to begin documenting all the additional information in the specified formats as required for attestation. With less than 6 weeks left before the absolute last day for starting to measure, there is practically no chance that this group will be able to attest this year, and many registered with a clear intent to postpone Meaningful Use to 2012 anyway. Third, there is a significant number of doctors whose plans and efforts are being frustrated by shortcomings of EHRs and EHR vendors. This last group warrants a closer look. Judging by press releases and earning reports from publicly traded EHR vendor companies, business is booming and EHRs are selling like hot cakes. The flip side, of course, is that waiting times for software installation are steadily increasing for both new purchases and upgrades. Since ONC certification bodies have no requirements stating that the certified software should be in actual use by customers, many vendors were able to certify EHR versions that were not ready for general deployment. Some vendors deemed it necessary to charge significant fees for functionality required for Meaningful Use in addition to the ongoing maintenance fees which should have entitled their existing customers to a free upgrade to the certified version. Adding it all up results in many unhappy customers having to wait in long lines for something that should have been forthcoming, and having to spend large sums of money on something that should have been free. And when they finally reach the front of the line and pony up the various extortion fees, they may still end up right back where they started. 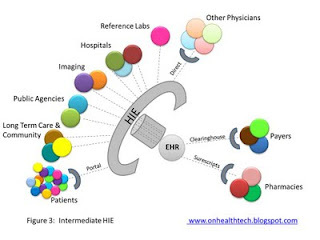 Over a year ago, on this blog, I posed a very simple question: “Can you buy an ONC Certified EHR, or a package of EHR modules, and discover to your chagrin that no matter how hard you try, Meaningful Use is not within reach?” After a close look at the certification criteria for EHR software, my conclusion was that “Physicians need to understand, and ONC needs to clarify, that although required by CMS, ONC EHR certification does not guarantee availability of all EHR features and functionalities required to achieve Meaningful Use.” Of course physicians did not understand and ONC did not clarify and here we are today fully engaged in damage control. The problems range from rampant software defects to impossible workflows to plain missing functionality. How is that possible? If you ever dabbled in software development, you should know that successfully testing a few predetermined isolated function points in a large software package is never an indication that the software works as designed. To use our beloved car analogy, starting the car once, turning the lights on once and activating the wipers once provides no solid indication that the car is not going to explode after two minutes on the highway, let alone that both wipers and lights will keep on working as you proceed out of the dealer parking lot. Now imagine that the car seller is allowed to performs all these tests while you are standing aside, observing the final result only. So a hotwire instead of an ignition key, a string attached to the wrist to pull the wipers back and forth, and a bunch of little flashlights instead of brake lights are all possible. That’s the essence of Meaningful Use EHR certification testing. Sometimes you get lucky and sometimes the thing you just bought smokes, and barely limps along sputtering motor oil and antifreeze. But nothing is more misguided and inappropriately tested as the various requirements for interoperability. There are several Meaningful Use measures requiring that the EHR has the capability of exchanging information with other facilities, and that the user performs just one test of that capability to qualify for incentives, and the test does not even have to be successful. Sounds easy when you sit in a conference room overlooking blossoming cherry trees on the Potomac. Returning to cars, imagine that the requirement is that the vehicle is able to tow another car, or a U-Haul little trailer, or a boat. During certification, the vehicle presents with a lovely towing package installed; the tester attaches a cardboard car model to it and the entire assembly is shown to be able to advance one inch from where it was originally located. Hence, the vehicle is now certified for towing cars. The first thing you discover after you purchase the certified vehicle is that the various towing packages don’t come standard with the car. You will have to pay for each one and pay to have it installed. To add insult to injury, the towing packages have only been tested with cardboard models and there is much work to be done before they can be tested with real boats, cars and trailers. And there are several hundred customers in line ahead of you. Perhaps you should call again in a few months, or better yet don’t call us; we’ll call you. To qualify for Meaningful Use incentives a physician must perform at least one test of submitting either public health data or immunizations data to a public agency. Exclusions apply to those who do not administer immunizations and to those who practice in a State where there is no public agency capable of accepting such data. There are less than a dozen agencies where one could submit public health data, but many more immunizations registries up and running. A typical very large EHR vendor will have operational interfaces to less than a handful of immunization registries that are readily available for purchase, usually in States where health information exchange is very advanced. Everywhere else money can’t buy you an immunization interface. It can buy you a place in line, if the vendor is working on an interface with your State registry. Otherwise a rain check is the most you should expect. There is no way physicians could have anticipated this problem when they purchased a fully Certified EHR. There is nothing physicians can do now, or could have done earlier, to address this problem. And there is no way for EHR vendors to create over 50 working interfaces to State registries and deploy thousands of those interfaces to their customers before the clock runs out on 2011 reporting periods. By ignoring the reality on the ground, CMS erred in its requirement and ONC erred in its certification process. The only thing left to do now is for CMS to officially allow exclusion of public health measures across the board. An apology wouldn’t hurt either…. According to the latest count, there are 255 Health Information Exchange (HIE) organizations across the country, which amounts to an average of 5 in each State. If you are a practicing physician and have an EHR, chances are someone already knocked on your door offering to connect your practice to the local HIE for a small fee. If you don’t have an EHR, you may have had offers to access an HIE web portal, or maybe an HIE supplied EHR Lite, allowing you to at the very least view clinical data from other sources. Perhaps for free. If you are the proud owner of one of the full-featured EHRs, you may wonder what an HIE can do for you that your EHR is not already doing, and whether that service is worth your hard earned money. In theory, a top-shelf EHR should be able to connect your practice to multiple facilities and allow you to exchange information to the best of all participants’ abilities. Granted most EHRs are still working on some of the connections, particularly to local facilities, but all in all, an EHR should be able to eventually provide for all your connectivity needs as shown in Figure 1. Note that for some types of connections, your EHR vendor can use a clearinghouse or portal approach to simplify and reduce costs of connectivity. For example, you don’t need a separate interface for each pharmacy – you use Surescripts as the clearinghouse and let them worry about it. You also don’t need an individual connection to each patient’s home – you communicate with all of them through one portal. With the exception of Surescripts pharmacy connectivity and a small number of reference labs, each connection, or interface, is costing you a pretty penny, and the more local the connection, the longer it takes to build. Enter the local HIE. The value proposition of a regional exchange is in connecting you to local hospitals, imaging centers, State agencies and community resources. Figure 2 shows a typical HIE arrangement. If you compare this to Figure 1, it becomes apparent that your EHR vendor has a much easier job now. Instead of building an interface to each hospital, the vendor needs just one interface to the HIE and presto, you are connected to all hospitals. Yes, this is an outlandish oversimplification of affairs, since most players have no ability to connect to HIEs and since each message type requires its own separate interface (or special code to sort messages out). If your EHR vendor has a critical mass of customers in your area, all needing to connect to the same regional facilities, a connection to the HIE should create significant savings for the EHR vendor, and hopefully some of those savings will be passed down to you. The HIE will in turn try to get a portion of that money from you to cover their costs of building and maintaining interfaces. If there is more than one HIE in your referral region, your EHR vendor may need to repeat the effort for each HIE. This will increase the complexity and costs for all involved. Some HIEs are trying to do more. Although EHR vendors are increasingly integrating abilities to exchange information between physicians through the Direct Project protocol, HIEs are attempting to do the same thing. Depending on your EHR vendor, the HIE may be a few steps ahead and will offer you that functionality. Of course, it will not be integrated in your EHR workflow, but it may still be worthwhile. Since most HIEs retain data exchanged through them (or have the ability to retrieve it from the source), they are also considering offering patients access to their data. If your EHR vendor does not offer a Patient Portal or charges a lot for one, this may be a very tempting proposition. Figure 3 illustrates this more comprehensive setup, which also includes connectivity to reference labs, as this is a simple thing to do and several HIEs are doing just that. The HIE menu of services in Figure 3 will cost you substantial subscription fees, and rarely some transactional fees, on top of what you are paying for your EHR. If you don’t have an EHR, some HIEs will offer you a one stop shop, which can include a lighter version of an EHR (geared to Meaningful Use), which includes electronic prescribing. This may be a cumbersome solution if you still need to maintain a paper chart, and perhaps this is why the top HIE vendors offer EHRs that are fully functional and which only need to be connected to your Practice Management System (PMS), as shown in Figure 4. In this scenario, you would have to pay the HIE a hefty price, but you won’t have to pay extra for another EHR. Finally, there is at least one HIE out there, and I am certain more will follow, which can accommodate your billing needs as well. 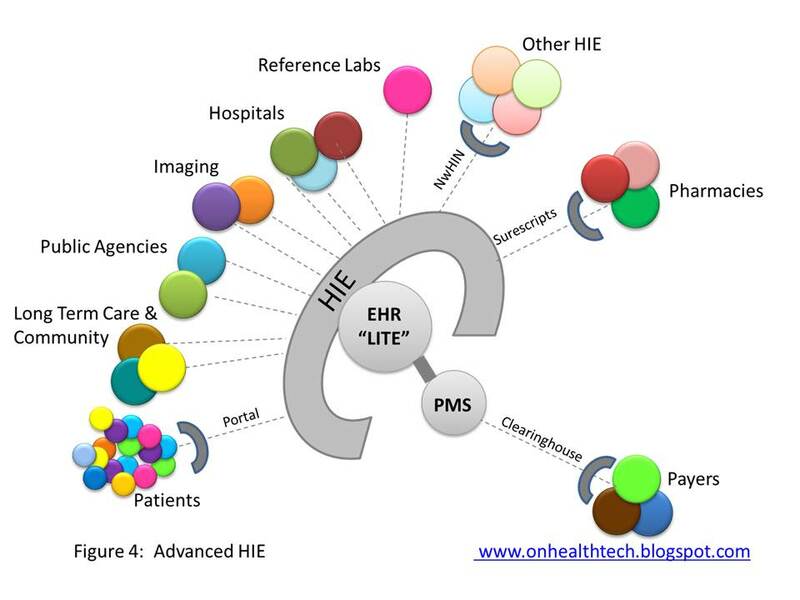 Having come full circle, Figure 5 illustrates the complete transformation of the HIE into a complete EHR and PMS. The difference between Figure 1 and Figure 5 is not just terminology. 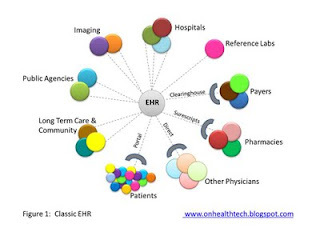 The system in Figure 1 stores data either in individual physician databases or in a national database of all EHR customers for an Internet based EHR. In Figure 5, you are accessing an EHR that contains the data of other physicians, hospitals and care agencies in your area. This is a much more powerful configuration and better suited to care coordination and care management. This is pretty much how large health care systems are set up and in most cases the HIE is run by their enterprise EHR vendor. 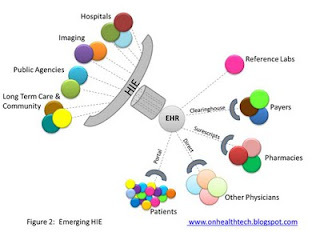 In fact, just like HIE vendors are building EHRs, most large EHR vendors either have, or are quickly assembling, formal HIE capabilities (master patient index, good interface engine, robust database structures). So here is a wild prediction: it may take a while, but eventually small EHR vendors will be replaced by strong HIEs, and weak, failing or nonexistent HIEs will be displaced by large EHR vendors who had the ability and wisdom to become HIEs, and there will be no distinction between the two types of software vendors. Right now the 255 HIE organizations across the country are struggling to find a way to become sustainable businesses, and most EHR vendors, while posting record profits, are struggling to provide much needed interoperability. A marriage of necessity is inevitable. What should we name the baby?